Land Destroyer: Who's Driving the Rohingya into the Sea? Who's Driving the Rohingya into the Sea? 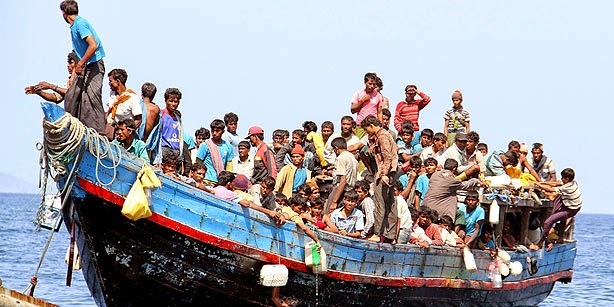 May 30, 2015 (Tony Cartalucci - NEO) - As the plight of the Rohingya, driven from Myanmar into the sea, gains increasing international attention, the same familiar voices across the West have begun climbing upon their soapboxes and pointing fingers at each and every nation refusing to accept them upon their shores. What is not mentioned, conveniently, is who drove them into the sea to begin with. The Rohingya are a predominately Muslim people living in Myanmar's southwest state of Rakhine - and have lived there for generations. Many may be indigenous to Myanmar, having settled their centuries ago. Others may have come to Myanmar as a result of British rule during the 1800's. Image: Aung San Suu Kyi, (left) purveyor of Western "pro-democracy" gags, now finds herself presiding over a movement using these gimmicks to call for racial genocide. A "monk" (right) puts his US State Department subsidized color revolution training to a new use... calling for genocide. So far, Suu Kyi has categorically failed to condemn the violence mainly because it is being carried out by the backbone of her own political network. The group that is in fact driving the Rohingya from their homes in Myanmar and into the sea - and why this is not reported as the center of the current crisis - are the followers and supporters of the West's own "patron saint of democracy," Aung San Suu Kyi. 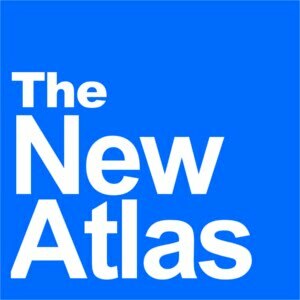 These NGOs and faux-news agencies include the Irrawaddy, Era Journal, and the Democratic Voice of Burma (DVB), all admitted by the Burma Campaign UK (page 15) to be funded by the US National Endowment for Democracy (NED) along with "Mizzima" also fully funded by NED and convicted financial criminal George Soros' Open Society. There is also the "Burma Partnership" which upon its "About Us" page is listed a myriad of associations and organizations directly linked to Aung San Suu Kyi's National League for Democracy (NLD) party, including the Students and Youth Congress of Burma, the Forum for Democracy in Burma, and the Nationalities Youth Forum, which is directly funded by the Euro-Burma Office (in turn funded by the EU, and US National Endowment for Democracy), and Open Society. The heavily US-British-backed Noble Peace Prize laureate's followers have prosecuted a campaign of ultra-racist genocide aimed at eradicating Myanmar entirely of the Rohingya people, often with orgies of machete-wielding brutality and neighborhood-wide arson leaving scores of people dead, and hundreds, sometimes thousands homeless, destitute, and above all, desperate. Leading the violence are Suu Kyi's "saffron monks." The so-called "Saffron Revolution" of 2007 seeking to oust the Myanmar government and put into power Aung San Suu Kyi and her "National League for Democracy" was named so after the saffron-colored robes of these supporters. Underneath the "pro-democracy" narrative, however, is an ugly truth that if known more widely amongst the global public, would spell the end of both Suu Kyi and her foreign backers' agenda in Myanmar. While the Western media attempts to shift the blame on the Myanmar government itself for the current Rohingya crisis, it was the government that attempted to grant the Rohingya citizenship through incremental programs that included allowing them to vote in upcoming elections. The plan was, however, disrupted by violence spearheaded by Suu Kyi's followers, as reported by Australia's ABC News article, "Myanmar scraps temporary ID cards amid protests targeting ethnic minorities without citizenship." The irony of Suu Kyi's supporters, supposedly representing a shining example of democracy worthy of a Nobel Peace Prize, attempting to deny hundreds of thousands of people their right to vote in elections is immeasurable. Suu Kyi, for her part, has remained utterly silent regarding the brutality and inhumanity of her most loyal and active supporters. While she is portrayed as a woman of courage and conviction, in reality these "virtues" were bought and paid for through millions of dollars of support for both her and her political network over the decades by the US and British governments. While her silence is shrugged off by the Western media as "pragmatic" and "calculated," it is in reality merely her refusal to condemn the very supporters who have carved out a niche for her amid Myanmar's political landscape. This carving has left a trail of blood and tears, one the Nobel Peace Prize has been shamefully used to distract the world's attention away from for years now. 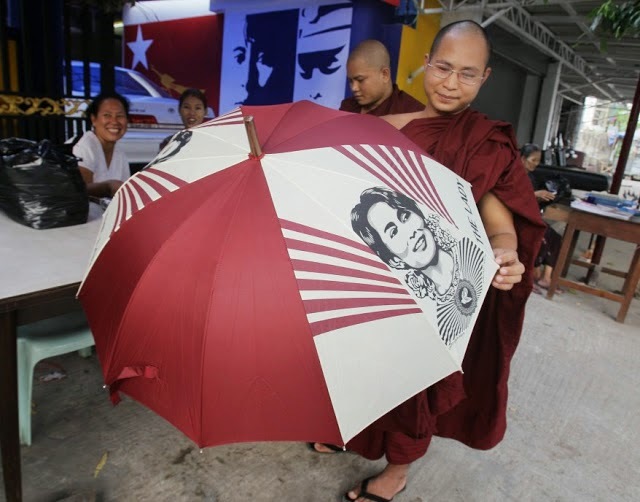 Among Suu Kyi's saffron butchers, there stands out one leader in particular, Wirathu. Wirathu has been involved in stirring up politically-motivated violence for over a decade. In particular, his group has carried out a bloody campaign against the Rohingya, even landing him in prison in 2003. Image: Suu Kyi's "saffron" supporters demonstrating in favor of the ethnic cleansing of Myanmar with their sign specifically calling for all Rohingya to be driven from the country. Their demonstrations coupled with unhinged brutality is the singular cause of the current, and increasingly regional humanitarian crisis now unfolding. By all accounts, Wirathu is a violent criminal leading mobs which have cost thousands of people their lives and has created a humanitarian crisis that is slowly engulfing all of Southeast Asia. Yet Wirathu is still counted among Suu Kyi's most vocal supporters and frequently weighs in on high level decisions made by Suu Kyi's political party. Furthermore, the West has failed to condemn him, place any sanctions upon him, and through their various media outlets, still grant him interviews, lending him continued credibility and influence. Beyond Wirathu, there are other "monks" who took to the streets in 2007's "Saffron Revolution,"a series of bloody anti-government protests in support of Aung San Suu Kyi. 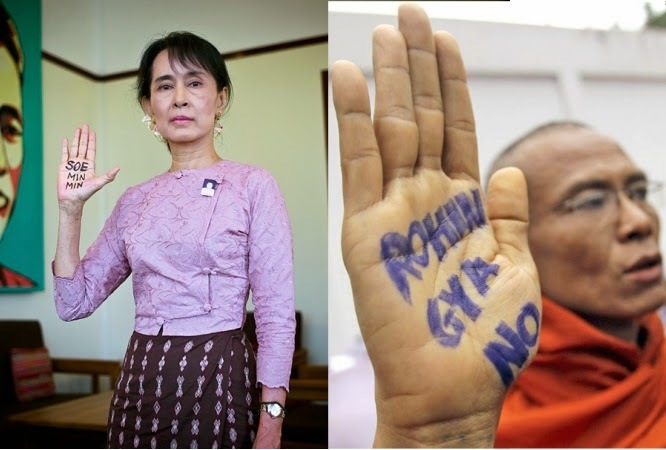 Human Rights Watch in a report titled "Buddhism and activism in Burma" (.pdf), would specifically enumerate support provided to Aung San Suu Kyi's movement by these organizations, including the Young Monks Union (Association), who are also now leading violence and calls for ethnic cleansing across Myanmar against the Rohingya people. 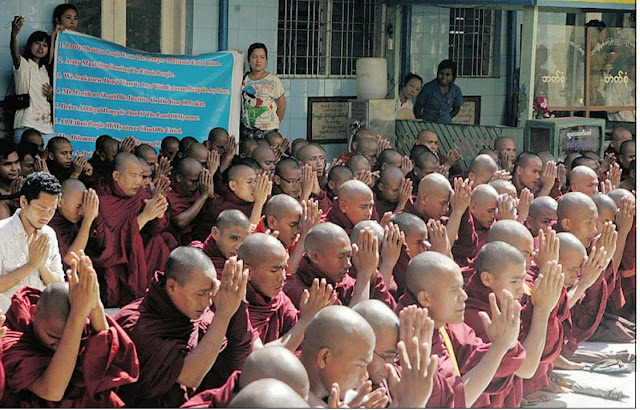 The UK Independent in their article, "Burma's monks call for Muslim community to be shunned," mentions the Young Monks Association by name as involved in distributing flyers recently, demanding people not to associate with ethnic Rohingya, and attempting to block humanitarian aid from reaching Rohingya camps set up after being driven by their homes by violence. Are Myanmar's Neighbors to Blame? This systematic genocidal brutality is what has driven the Rohingya to the seas from their rightful homes in Myanmar, scattering them abroad and creating a humanitarian crisis for other nations to bear. In particular, Myanmar's neighbor Thailand has been criticized vocally by the West as this crisis continues on, and more so now than ever since Thailand has ousted Washington and Wall Street's political order of choice there in a military coup in 2014. But it is clear that the source of the problem is in Myanmar, and in particular the violence being used to drive the Rohingya from their homes. Myanmar's neighbors are but scapegoats for perpetrators not politically convenient for the Western media and the West's many so-called "international" institutions and rights organizations to name and shame. 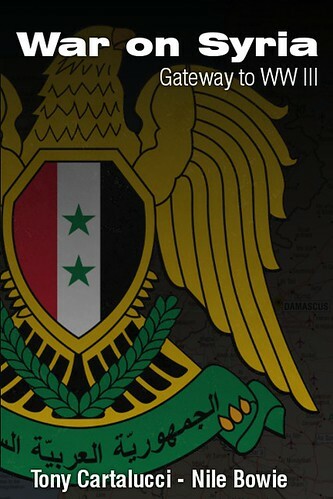 If anything, the perpetrators have created a political and humanitarian crisis regionally, giving the West an opportunity to meddle even further. Image: British imperial meddling brought the Rohingya to Myanmar generations ago, now the US and British are backing political groups driving them out of Myanmar with unhinged violence. While the Western media points in all directions to place the blame for this growing humanitarian crisis, it is the West itself that has created it, every step of the way. Regardless of what Myanmar's neighbors do to assist Rohingya being driven from their homes, if the violence driving them abroad to begin with is not stopped, the humanitarian crisis will only continue to grow. Such violence, however, cannot be stopped so long as the self-proclaimed arbiters of international order and human rights not only refuse to condemn those guilty of precipitating this crisis, but in fact actively defend and support them. For Southeast Asia, and in particular, Myanmar, Thailand, and Malaysia - all nations targeted by the US and British with perpetual political meddling - exposing the true perpetrators of this crisis, and in particular the political order under which these perpetrators are operating, can expose Aung San Suu Kyi and her party and disrupt other foreign backed political proxies across the region like her. By doing so, perhaps an end can be brought to this current crisis today, and the next one prevented from unfolding tomorrow. The Ronhingya are not "stateless." They are not "boat people." They are not "without a home." Their home is Myanmar. Ultra-racist genocidal criminals, apparently with the support and blessing of the West, have driven them from that home.